Cedarhill Estates is in the heart of Nepean and surrounds the Cedarhill Golf Course. It is a prestigious community comprising some 100 superb custom homes built on one-acre lots, a rare gem in the region. Cedarhill is strategically located midway between Ottawa and Kanata, and the center of either can be reached by car in about 15 minutes using Highway 416 and the Queensway. Two nearby interchanges provide easy access. Cedarhill typifies the very best of country living while in the middle of a large metropolis. Surrounded by green belt and Agriculture Canada lands, the residents of Cedarhill truly enjoy all of the benefits of living in Bell South Nepean, a ward that comprises a mix of urban and rural developments, and the ward that is experiencing the fastest growth in the Region. The residents of Cedarhill take great pride in their unique community as well as in their superb homes. Evidence of this pride is reflected in the fine landscaping and exquisite flower gardens that can be seen throughout the community. 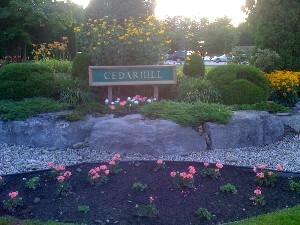 Cedarhill Estates is not only a beautiful community but also one that is well organized. The Cedarhill Community Association is remarkably well supported by its residents. Community funds are used mainly to keep the area beautiful with flowers and plants in community flower beds and to keep the common areas neatly trimmed and weed free. The Cedarhill Community Association has several meetings a year that are a delightful mixture of community business and socializing at either pot-luck dinners, barbecues or wine and cheese parties. The Cedarhill Community Association Executive consists of volunteer residents who perform the functions of president, secretary, treasurer and coordinators for landscaping, membership, welcoming and special events such as family barbecues. The Community is blessed with dedicated and hard working volunteers who keep things looking beautiful.